Through much of World War II, Allied bombers would sometimes drop leaflets warning of impending bombing of a city. The leaflets often told civilians to evacuate, and sometimes encouraged them to push their leaders to surrender. 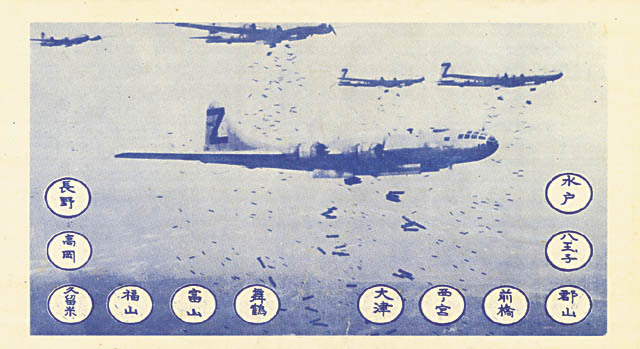 In August 1945, leaflets were dropped on several Japanese cities (including, supposedly, Hiroshima and Nagasaki). The first round, known as the "LeMay leaflets," were distributed before the bombing of Hiroshima. These leaflets did not directly reference the atomic bomb, and it is unclear whether they were used to warn citizens of Hiroshima and Nagasaki specifically. The second round features a picture of a mushroom cloud and a message about the Soviet invasion (which commenced on August 9). The historical record is unclear, but it seems as though these leaflets did not make it to Nagasaki until after it, too, had been hit by an atomic bomb. Later leaflets informed the Japanese populace about their government's surrender before the emperor's official announcement. Read this carefully as it may save your life or the life of a relative or friend. In the next few days, some or all of the cities named on the reverse side will be destroyed by American bombs. These cities contain military installations and workshops or factories which produce military goods. We are determined to destroy all of the tools of the military clique which they are using to prolong this useless war. But, unfortunately, bombs have no eyes. So, in accordance with America's humanitarian policies, the American Air Force, which does not wish to injure innocent people, now gives you warning to evacuate the cities named and save your lives. America is not fighting the Japanese people but is fighting the military clique which has enslaved the Japanese people. The peace which America will bring will free the people from the oppression of the military clique and mean the emergence of a new and better Japan. You can restore peace by demanding new and good leaders who will end the war. We cannot promise that only these cities will be among those attacked but some or all of them will be, so heed this warning and evacuate these cities immediately. ATTENTION JAPANESE PEOPLE. EVACUATE YOUR CITIES. Because your military leaders have rejected the thirteen part surrender declaration, two momentous events have occurred in the last few days. The Soviet Union, because of this rejection on the part of the military has notified your Ambassador Sato that it has declared war on your nation. Thus, all powerful countries of the world are now at war with you. Also, because of your leaders' refusal to accept the surrender declaration that would enable Japan to honorably end this useless war, we have employed our atomic bomb. A single one of our newly developed atomic bombs is actually the equivalent in explosive power to what 2000 of our giant B-29s could have carried on a single mission. Radio Tokyo has told you that with the first use of this weapon of total destruction, Hiroshima was virtually destroyed. Before we use this bomb again and again to destroy every resource of the military by which they are prolonging this useless war, petition the emperor now to end the war. Our president has outlined for you the thirteen consequences of an honorable surrender. We urge that you accept these consequences and begin the work of building a new, better, and peace-loving Japan. Act at once or we shall resolutely employ this bomb and all our other superior weapons to promptly and forcefully end the war. This photo shows the destructive power of the atomic bomb that was dropped on Hiroshima. This photo was taken from B-29 in the air after the atomic bomb was dropped on Hiroshima on August 6. The atomic bomb’s horrendous destructive power can be understood by viewing this photo. 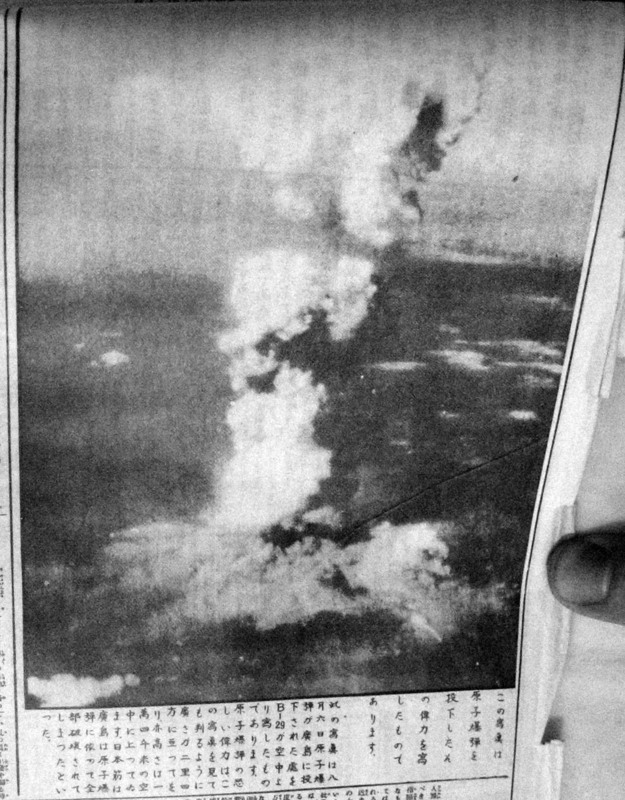 As you see, this atomic bomb blast extended to a radius of 8 km, and the height of the bomb cloud reached about 14,000 m into the sky. The Japanese government said that Hiroshima was completely destroyed by the atomic bomb. LeMay leaflet listing bombing targets. Image courtesy of Alex Wellerstein. Alex Wellerstein, "A Day Too Late," Restricted Data: The Nuclear Secrets Blog, 2013. Alex Wellerstein, "The Hiroshima leaflet," Restricted Data: The Nuclear Secrets Blog, 2013. Josette H. Williams, "The Information War in the Pacific, 1945," CIA Studies in Intelligence, 2002.